Could Kelly Ayotte's Rapid Rise Lead to VP? In less than two years' time, Kelly Ayotte has gone from obscure New Hampshirite to one of the more visible figures in national politics. The freshman senator is often photographed alongside Mitt Romney as one of his leading surrogates on the campaign trail (and the most high-profile female surrogate other than his wife), and the Senate Republican leadership trots her out frequently to go before cameras and drive their message on whatever legislation they’re pushing. No wonder Romney has named her publicly as one of about 15 people who might be on his list of potential running mates. But anyone who dismisses her from the veepstakes chatter because she is an attractive woman in her early forties, who ascended to statewide office in the most recent election -- thereby inviting obvious comparisons to former Alaska Gov. Sarah Palin -- would be writing her off unfairly. So, too, would anyone who says such attributes are the only reasons for her rise. At 43, Ayotte is one of the three youngest members of the upper chamber, along with Florida’s Marco Rubio and Utah’s Mike Lee (R) -- both 41 and Republicans -- all of whom were elected in 2010. She spent five years as the Granite State’s attorney general, prosecuting murder cases and even arguing a case before the Supreme Court, before she entered the Senate. She helped launch her husband’s business, a snowplowing and landscaping company. And in her time in Washington, she’s set herself apart by joining the Armed Services Committee and making the high-profile battle over Guantanamo detainees her pet issue -- key national security credentials that could help bolster the Republican ticket in an area where Romney lacks experience. And yet, though some of her Senate colleagues have been cagy regarding their status as potential running mates, Ayotte was perfectly open during an interview in her Senate office Thursday morning. Of course, Duprey’s wife, Susan, travels with Ann Romney on the campaign trail and has become a “close confidante” to the presumptive nominee’s wife, according to the Boston Globe, meaning the Dupreys might have an inkling about whom the Romneys are considering. 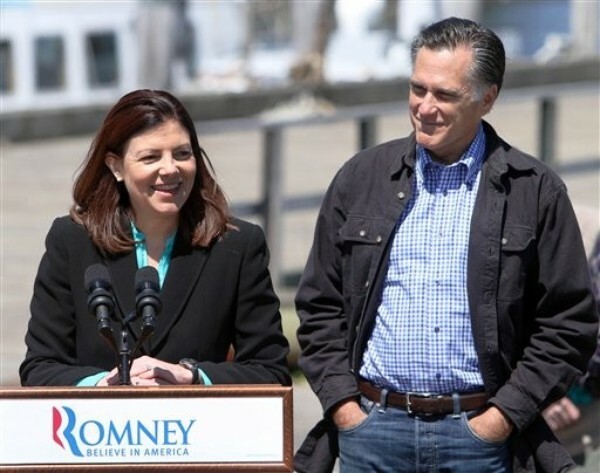 Ayotte came to politics in a far different way than Mitt Romney did. She was born and raised in Nashua, N.H., in a military family, left the state for a degree in political science at Penn State, and got a law degree at Villanova, returning to Nashua afterward to become a prosecutor. She married another Nashua native, Joe Daley, who is a veteran of Desert Storm and now runs that landscaping and snowplowing business, Daley Outdoor Services. That background as well as her husband’s (her closest political adviser) are what helped Ayotte obtain some plum committee assignments in the Senate: The Armed Services Committee, the Budget Committee, the Commerce Committee and the Small Business and Entrepreneurship Committee. She’s brought expertise to the table in each of those areas, but emphasizes that she does a considerable amount of homework to get up to speed on specific issues. Homework is something she says she’s used to doing from her days as attorney general, and it’s an important skill for a politician to have if one needed to prepare on the fly for, say, the presidency. Indeed, her last two high-profile jobs in public service came as something of a surprise -- or perhaps just earlier than she expected -- and she rose to the challenge on both occasions.